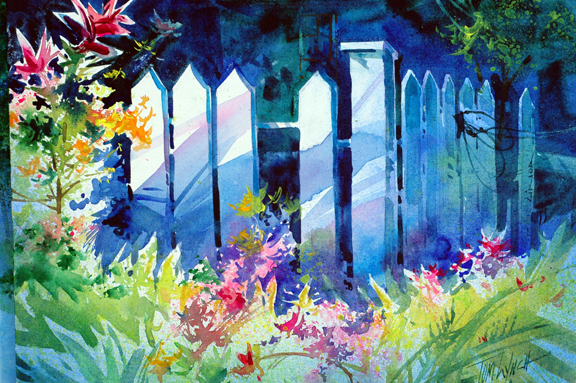 If you're interested in learning transparent watercolor techniques, sign up now for class beginning Oct.1, 2013 and ending Dec. 3rd. There will be 8 classes on Tuesday afternoons from 1 PM to 4 PM (no class on Oct. 15th & Nov. 12th). A variety of techniques and procedures used in transparent watercolor painting will be explored, such as direct & indirect painting, washes, negative painting, etc. The course will include instruction in composition (design principles,) color theory, and the use of values to create contrast. Instructor is Debbie Aken and class fee is $80.00. Come prepared with subject matter to paint. A composition pre-sketched on stretched paper would allow you to use the bulk of class time painting. Ideally, two separate boards, each with a stretched paper, would allow you to work on one while the other painting is drying. Having at least two compositions going simultaneously is essential if you want to get the most of your class time. A pencil and eraser (preferably a rubber kneaded, as it won’t damage your paper. Watercolor paints – pan or tube – good quality as “cheap” paint can be frustrating. Mixing tray – white – large – you need plenty of space for mixing & easy clean-up. Brushes – rounds, flats, and bamboo Chinese brushes (hold a lot of water and form a fine point.) The correct brush is important. You don’t need a lot of brushes- just good ones that are for watercolor - rounds and flats that hold a lot of water.